Cage Fight: KFC’s Double Down vs. Sanity | Andrea Works . . . In his youth, I’ve seen your dude consume much worse. Maybe this should become KFC’s “McRib”. Something that pops up on occasion, causes a firestorm, and then goes away. I’d try it once. But this is probably something I’d try to make at home and have it taste so much better. 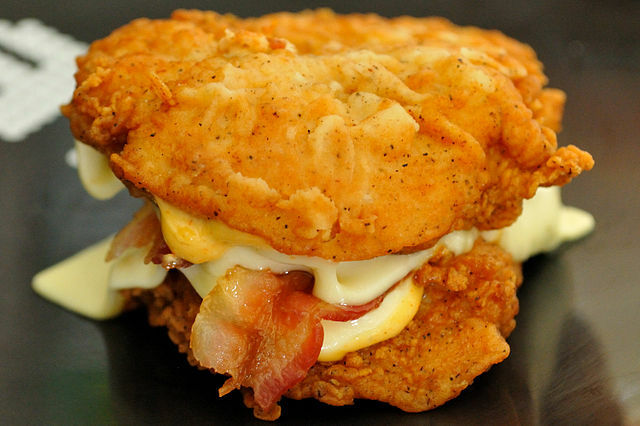 Dude…I just saw THE BEST (and most nausea-inducing) description of the Double Down ever written: “an unwieldy fried Meat Oreo .” And with that image firmly implanted in your mind’s eye….you’re welcome. I have to say the KFC version of this was only just barely edible. But the concept is good: I’d pay way more than 5.49 for this same idea executed with non-factory-farmed chicken and bacon, real cheese, and a sauce (Lusty Monk, methinks) to be determined later. That’s how gluten-free ought to be.